It was finally time to visit the home of the blues and the birthplace of Rock n Roll! Memphis, Tennessee. Also home to that singer you may have heard of, they call him the King. For 3 nights we partied with the best of them! We didn’t get off to a good start in Memphis, after visiting the tourist information centre we realised the hotel we booked was far out of town and the buses don’t run there regularly. Taxis would cost us a small fortune so we decided to swallow the cost of cancelling our reservation and pay more for a hotel nearer to the action. Learning a valuable lesson that the cheapest hotel you can find may not always be the correct choice. 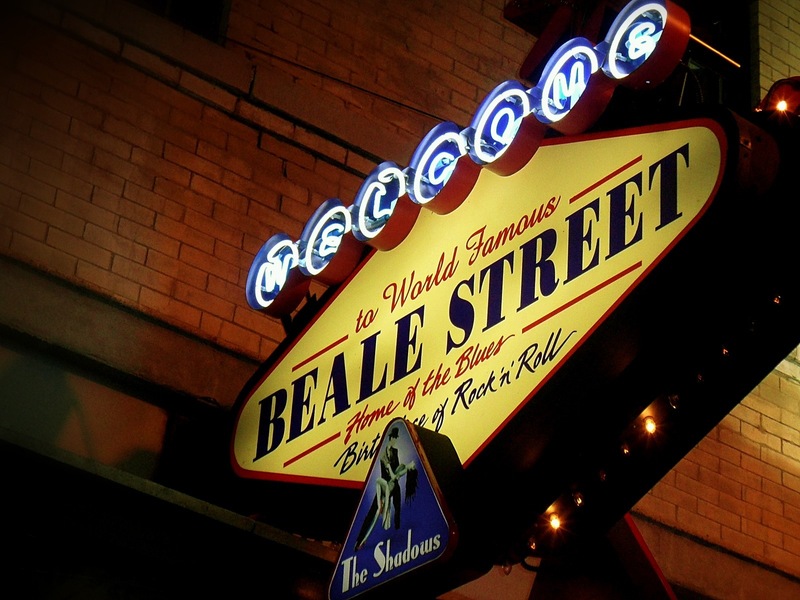 So with our new accommodation, we were just two blocks away from the famous Beale Street. 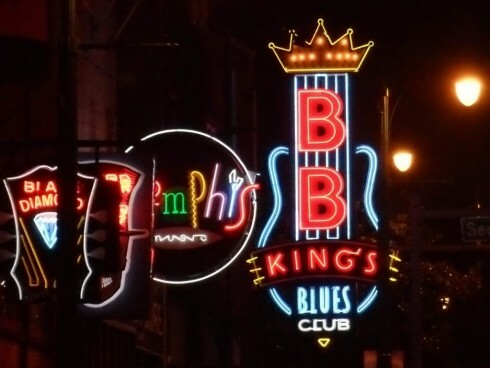 If you have not heard of Beale Street, it’s a street full of bars where live music is played in most of the venues, mainly jazz and the blues. A lot of great musicians started out on this street, for example Jonney Cash, BB King and the King himself was very influenced by this street as a teenager. On Beale Street, everyone serves you drinks in plastic cups so you can venture into the street, watch the street performers or just people watch and join in the fun. There are people everywhere, it’s like one big street party. We were lucky too as there was a free country music festival on in the park, so we got a bit of country music thrown in with the jazz and blues. On our first night in Memphis we were walking towards our hotel when we noticed several police cars blocking roads, a fire engine flying the American flag and a huge crowd including TV cameras had gathered. When we stopped to ask an officer what was happening we found out that sadly a few nights before we arrived an officer was shot dead on the road of our hotel. They were closing the roads to enable a parade of police cars to drive down the street as a sign of respect. We stopped to watch, and well after twenty minutes of watching car after car drive down decided we’d be there forever if we watched the whole thing! There were police cars from Memphis and surrounding areas, Sheriffs department cars, CSI vans, undercover cars, bikes and even helicopters overhead. Never let anyone tell you the Americans do things by halves. As I mentioned this place may be the home of the Blues but it’s also to home of Elvis, so it would be rude not to drop in while we were in the area. 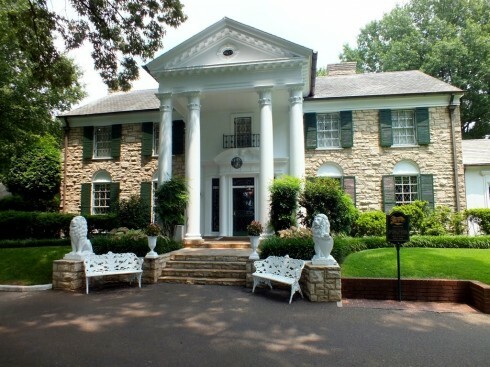 His home, Graceland, was opened to the public in 1982. Tours are available to walk through his house, see his planes and automobile collection. Visiting his house is like going back in time, everything is just how he left it. Not all of it decorated to everyone’s taste, a room dubbed the jungle room is filled with big wooden furniture, floors and ceiling both carpeted in green and a waterfall trickling down one wall. But it was the 70’s and were told it reminded him of Hawaii, a favourite place of his. You learn a lot about him on the tour, get to view his awards and costumes he wore in his films and on stage. Then at the end you visit his grave, his father moved him from his original resting place for security reasons. Now Elvis, his Grandmother, Mother and Father are all buried at Graceland. There’s also a plack in memory of Elvis’ twin brother. As we got the Sun Studios free shuttle to Graceland, we had to stop there for a tour on the way back, not really wanting to as we were tired from our day at Graceland we walked into Sun Studios thinking the sooner the tours over the better. 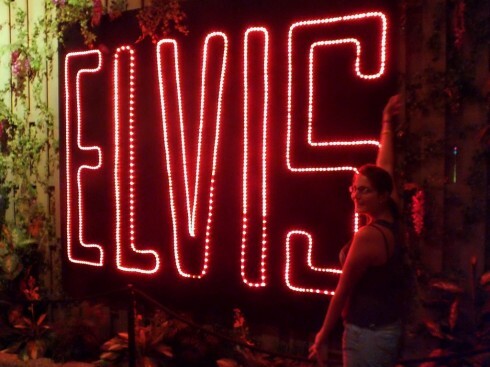 Turns out it was just as good as Graceland. The tour is of the old recording studio where Elvis recorded his first song. 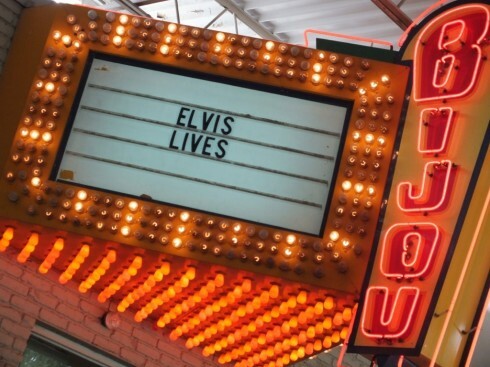 If it wasn’t for this place, Elvis may never have been discovered. 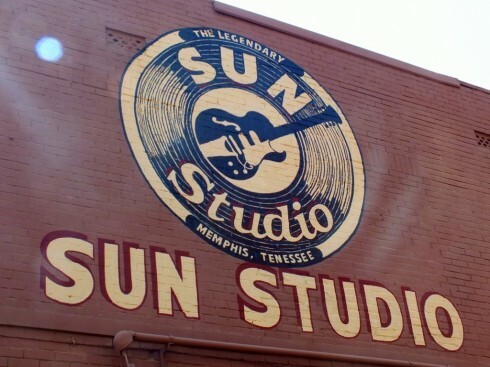 The studio was built with Beale Street in mind, the owner wanted to give the musicians he had heard on Beale Street the chance to record so their moto was that they would record anyone, and they did and in doing so discovered Elvis, BB King, Johnny Cash… The list goes on. Sam, the owner of Sun Studio also inadvertently invented rock n roll. A bands speaker had broken and they took it to Sam to try and fix, he put scrunched up newspaper in the speaker in attempt to fix it and this resulted in a rather distorted sound, which many claim to be the the basis of rock and roll. The studio has all the original recordings from back in the day and for years there was only one singers microphone, Sam kept the original microphone used by Elivs and everyone else who recorded in Sun Studios in the early years and you can touch it, sing into it and have your picture taken, I was so excited. All the original features are still in the studio and people still record there today, at night when the tours have finished. Bands like U2 and Maroon 5 have recently recorded there purely because it’s such a historical place and lucky I suppose. After a very educational day we hit Beale Street to sample the music we had learnt so much about, a few good songs and beers later we woke up in the hotel to realise the bus we were supposed to be on to New Orleans had left an hour ago. 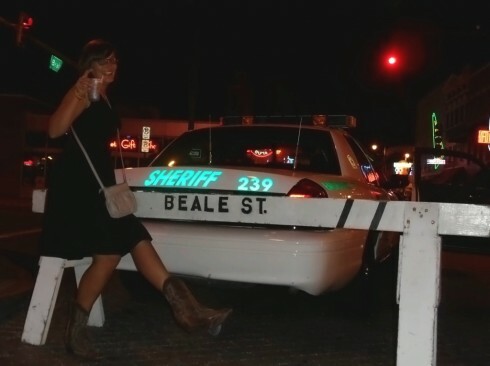 That’s Beale Street I suppose, so after a day nursing our heads we are now on our way to New Orleans all jazzed out. Thank you… thank you very much!